FAQ: What are the Different Natural Stone Finishes for Marble and Granite? There are distinct differences in how stone can be finished. The finish you select can affect not only the look of the stone, but it’s surface tendencies as well. But what do these finishes look like? What is the difference between them? And how do you care for stone with these finishes? Read on for the answers! A polished finish is achieved through a grinding and buffing process that results in a sleek, shiny surface. Go for a polished finish when you want to reveal the true color and character of marble and granite. In order to maintain the luster of polished stone, it’s important to use an appropriate daily cleaner and occasionally (every year or so, depending on usage and the type of sealant) re-seal the stone. A honed finish, also called a matte finish, is achieved through a sanding process and leaves the stone with a matte, satiny-smooth surface. Marble and granite with honed finishes are less slippery and known to conceal flaws better than other finishes since it does not have a reflection. Stone with a honed finish does require more frequent re-sealing than a polished surface. Honed finishes are ideal for a more casual or rustic look. A leathered finish is a newer style of finishing granite that has become increasingly popular in recent years. This specialty finish results in a rough appearance that is reminiscent of leather material. Because a leathered finished lacks any kind of shine, leathered stone hides fingerprints and smudges well. Leathered granite should be cleaned daily with a granite cleaner and microfiber cloth. In order to provide our clients with stone cleaners, sealers and polishes that are safe and effective, Prestige Marble and Granite offers a full line of GranQuartz stone care products. GranQuartz is a premium line of high-performing products designed specifically for marble, granite and other stone surfaces. For more marble and granite care and maintenance information, visit our post on How to Maintain Your Beautiful Marble or Granite Countertops. 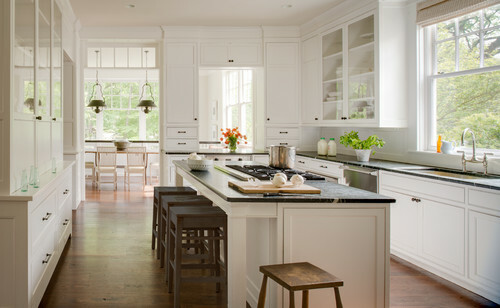 states the Benjamin Moore narrative on its recently unveiled 2016 color of the year, “Simply White.” Indeed, while seemingly simple, white is a powerful color that helps the eye to organize and direct; it’s extremely versatile, and it has a hygienic feeling. You see white and you think clean. And white is relaxing, because it gives your eyes a break from the visual overload we all seem to be experiencing in this digital era. White never feels trendy or dated; it always feels fresh, and it offers the opportunity to really express your personality through art, textiles and accessories. …it is a warm white, and it felt to us the cleanest and the most versatile. It looked fresh with a warm palette or a cool palette. It’s nothing like yellow teeth. White should never go in that direction. To avoid making a big mistake (with any color), Benjamin Moore recommends that you paint a sample on the wall (or even several walls), and look at it at different times of the day to see how it changes in different light. “Testing” your paint color first is really worth the effort. 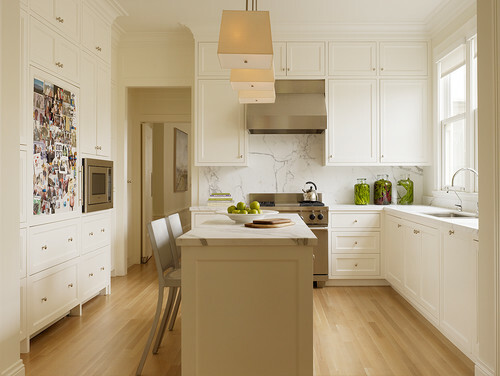 Simply White is clean and fresh looking, without appearing stark and cold. Here’s a look at some beautiful spaces painted in this powerful Color of the Year. 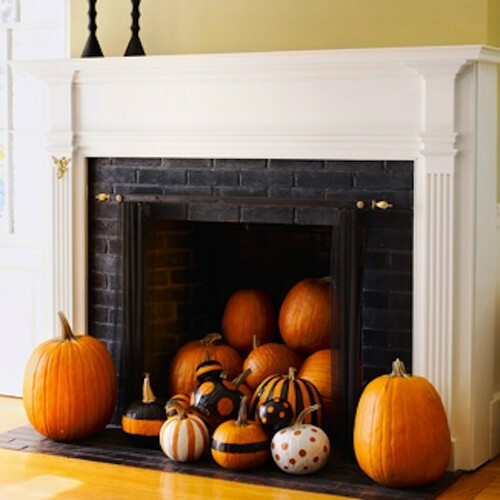 While it’s totally cool to go kitschy-spooky with your Halloween decor, there may be times when you might want to create a bit more of a sophisticated, creepy vibe. If you’re yearning for a Halloween look that will tickle the fancy of both kids and grown-ups alike, get inspired with these fun and festive ways to get your ghoul on. An abundance of pumpkins and gourds makes a festive display of autumn’s bounty. 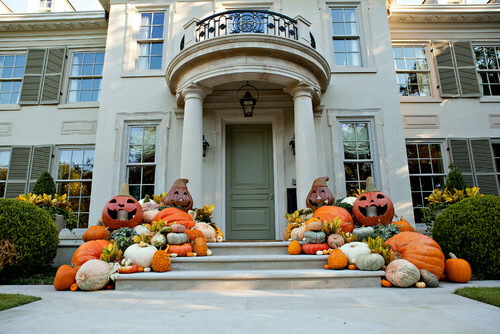 The cornucopian cascade is quite fitting for the home’s elegant entry and the delightful oversized jack-lanterns add just the right amount of Halloween whimsy. 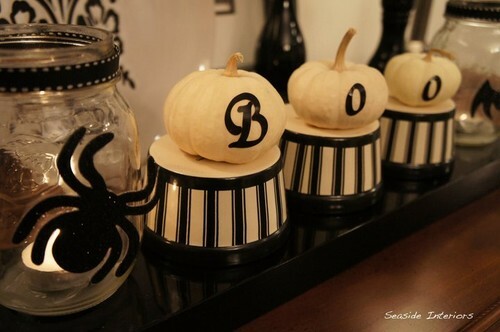 Here’s a pretty Halloween tableau that’s a lot more sophisticated than anything you would find at Party City! 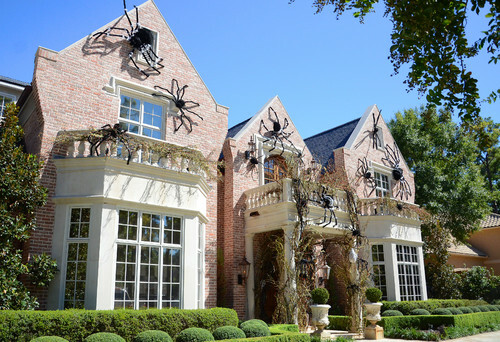 For a show-stopping ode to Halloween, just cover your home’s exterior with gigantic spiders! 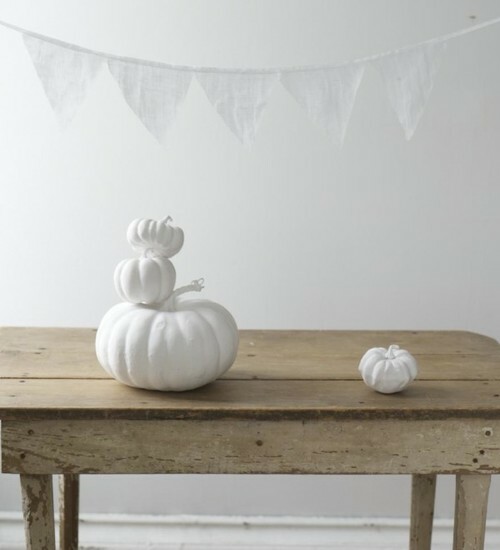 Less is more: these simple white pumpkins prove you don’t have to go over the top to show off your Halloween spirit. 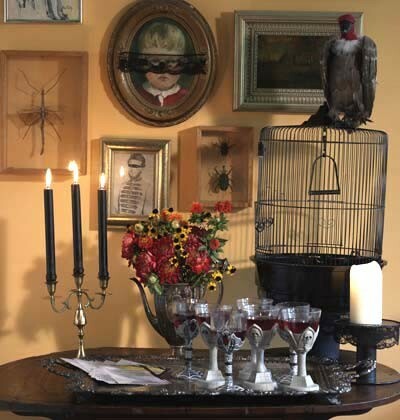 Eerie framed images and bugs, a vulture on a bird-cage, dead flowers and black candles. Straight out of Edgar Allen Poe, and it works! Orange pumpkins are fun. 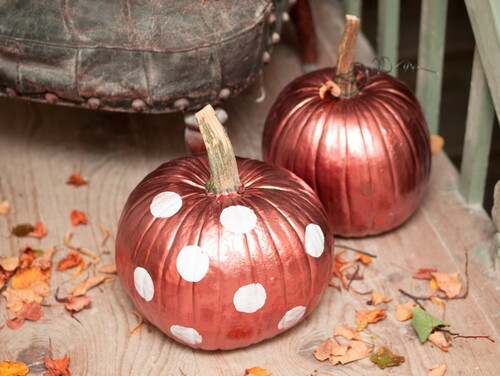 But metallic pumpkins? So much better! 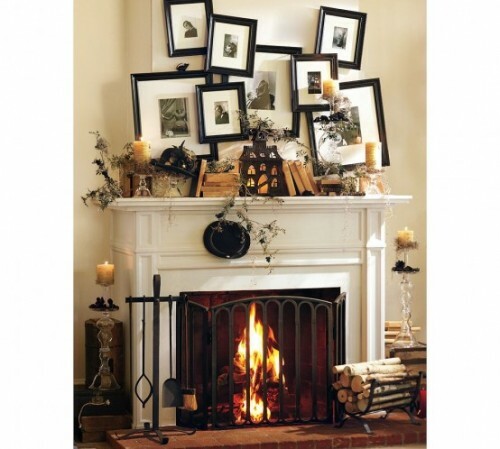 This mantle has a great Halloween vibe without an orange pumpkin in sight. Image Credits: Click on images to view sources.